Distance runners are always striving to find a happy medium between optimal training loads and minimising their risk of injury. With every step we run, forces of up to three times our body weight are put through our joints (a marathon itself requires around 40,000 steps). Therefore, we need to make sure we have sufficient biomechanics, stability and strength to best dissipate the forces from these steps. Every runner is an individual, each with our own asymmetries, weaknesses and restrictions; so our requirements are also unique with regard to the areas we need to focus on for injury prevention. However, there some things that everyone can do in order to be as smart as possible in training and reducing the risk of breakdown. Always listen to your body - If you feel good, push yourself, but, if you are having a bad day, then back off training and don’t worry about it; these things are part of normal training. Follow the 10% rule: Don’t increase your weekly mileage or a single training run by more than 10% on the previous week. As a clinician who sees a lot of distance runners, it is a very common cause of breakdown that I see time and time again, even in the most experienced runners. Your body needs time to adapt. Around 60% of injuries are due to training errors that are preventable. Mix up your terrain, do some hills, get off road and avoid running too much on a camber. Ensure adequate rest and sleep to allow the body to rejuvenate itself (you can monitor your morning heart rate and if it peaks, back off your training temporarily). Never underestimate the benefits of rest! Drink a minimum of 2 litres of water a day and eat a balanced nutritious diet. 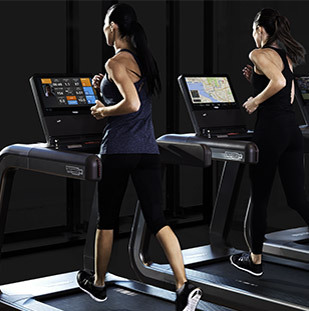 Using a treadmill can be an effective part of a marathon training schedule if weather, terrain, or a busy lifestyle is limiting you. 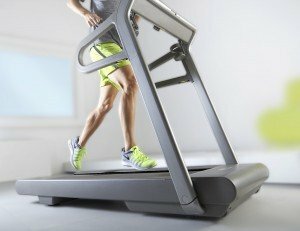 Whether it’s for fitting in interval training when you are unable to get to a running track, adding easy recovery runs if you live in a hilly area, or doing a hilly run if you live on the flat: a treadmill can help you balance your training load. 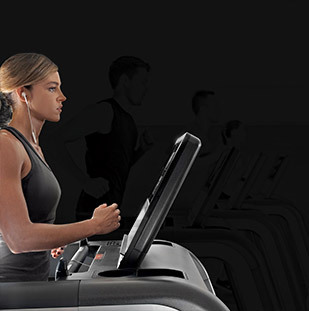 Many successful marathon runners incorporate treadmill activities alongside running outdoors as part of their training regime. The treadmill surface is softer than cement or tarmac so it can also help with injury prevention. It is important to have good mobility in our joints to allow for adequate load transfer through our body. Symmetry is also very important as a runner, as we are only ever in contact with the ground with one foot at a time. We often have one side that’s more restricted than the other, which can lead to compensations further along our kinetic chain and lead to injury. Key areas that are often blocked in runners are our ankles, thoracic spine and hips, so doing things such as dynamic stretches to open up these areas on a regular basis (perhaps as part of a warm up/down) can really help. Strength training = Less injuries and improved performance. Resistance training not only helps strengthen our bones but also improves our running economy. It makes us more efficient and able to run for longer periods at a faster pace, using less energy. The right strength program can help our ability to land and transfer loads more effectively though our body and also helps decrease fatigue levels in the later half of the race. It is often hard to find the time to fit in strength training with high running volumes. However, research has shown that doing a small amount of strength training, regularly, and gradually progressing the load each week, can improve our distance running performance by as much as 25% over a six week period. Key muscle groups to focus on are your gluteals, hamstrings, calves, core, obliques and latissimus dorsi (these drive your arms), and your hip flexors. You should do a mixture of body weight resistance exercises with high repetitions, but it is also very important to use higher resistance as well to create the power and explosion in your running. Your training should be as specific to running as possible so this means most strength work should be done in standing, and with only one foot in contact with the ground.